The Capsule Collider is made of two half-spheres joined together by a cylinder. It is the same shape as the Capsule primitive. See in Glossary Reference to the Physics Material that determines how this Collider interacts with others. Center The position of the Collider in the object’s local space. Radius The radius of the Collider’s local width. Height The total height of the Collider. Direction The axis of the capsule’s lengthwise orientation in the object’s local space. 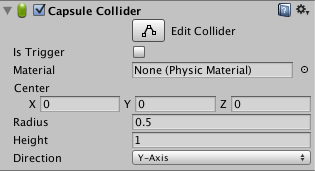 See in Glossary and works well for poles, or can be combined with other Colliders for unusual shapes.